I’ve been wanting to start up a screenshot series for a while, but have been trying to think of a different spin to do on it. The easy way, and the way I’ve done on Row Three in the past, is just to find a striking shot and post it with minimal commentary. But anyone can do that, and I have to make things harder on myself than that. At least I have to try – it may devolve to that before long. My friend Ryan at The Matinee does a great job of using a screenshot to lead into a critical point about the film as extrapolated from that one shot in his Freeze Frame series – I want to do something like that but not EXACTLY like that. So we come to this. I’m going to pick TWO shots. It’ll either be two shots from the same film and I’ll talk about how the two shots together play into the meaning of the film, or two shots from different films and I’ll talk about how they echo each other or play into a comparison of the two films. When I watched The Big Combo recently for the Movie Club Podcast, I was struck by how obviously the last scene echoed the end of Casablanca. Both films end in airport hanger, in the fog, with the final confrontation between two groups of people, one trying to arrest or kill the other. Yet the way we read these scenes and the people in them is completely different. Casablanca is story of love, war, resistance, and sacrifice, with jaded club owner Rick Blaine briefly reunited with the love of his life, who just happens to be married to a Czech Resistance leader on the run from the Nazis. The two major plot threads (of love and war) come together at the end, as Rick helps freedom fighter Viktor Laszlo to get a plane out of Casablanca before Nazi Major Strasser arrives to stop him, and simultaneously has to decide whether Laszlo flies out alone or with his wife Ilsa. 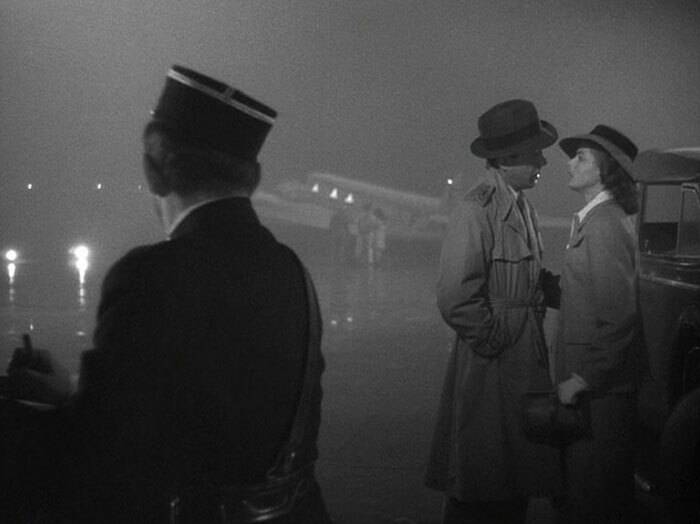 After one of the noblest speeches in all of cinema (“The problems of three little people don’t amount to a hill of beans in this crazy world”), Rick bundles Ilsa off on the plane, she and Laszlo get away, Rick shoots Major Strasser, and Rick and formerly corrupt Captain Renault walk into the fog presumably to join forces with the French Resistance and be BFFs. In this scene, the hunters are the Nazis and obviously evil, while our hero Rick makes a noble sacrifice of his personal happiness for the sake of the war effort. He walks out without his love, but with the knowledge that in his small way, he’s made a difference in a global conflict, and by so doing he regains his self-respect and purpose in life, a purpose he’d previously left back in Paris when he and Ilsa were separated by the coming of war. The Big Combo is a b-level crime noir with dogged detective Lt. Diamond trying to bust up a crime syndicate known as The Combination. Even his superior thinks the trail is cold, but Diamond is convinced that a Mr. Brown (who he’s been keeping an eye on via Mr. Brown’s moll Susan) is the ticket to finding the big boss. It’s suggested that Diamond is infatuated with Susan, but he’s also got a sometime gal in showgirl Rita. When Rita is killed as a side effect of his investigation, Diamond is even more determined to take down Mr. Brown. That leads to the confrontation at the airport, as Mr. Brown is about to jump on a plane with Susan and escape; instead cops corner and arrest him. Lt. Diamond and Susan are left in the hanger, then walk out together, disappearing into the fog. There’s a love triangle of sorts here, but a twisted and perverted one. Diamond may have been interested in Susan to some degree early on, but he really isn’t any longer by the end. Brown is a possessive psychopath, and though Susan says she loved him once, she hates him with a fiery passion now. Meanwhile, Rita makes the triangle a square (and that’s not even mentioning the mysterious Alicia, who has her own part to play in Brown’s downfall), but Diamond doesn’t really seem to love her either, though he certainly feels rightful guilt that his cavalier treatment of her led to her death (“I treated her like a pair of gloves. When I was cold, I called her up.”). In many movies, the two who leave together in the fog would be lovers, now clear to unite freely with Brown safely out of the picture. But here they’re together simply because they’re the only ones left. Two airports, two planned escapes via airplane (one successful), two planned arrests (one successful), two love triangles, two sets of characters walking off together in the fog. But they could hardly be more different. Casablanca is the epitome of classic Hollywood romantic cinema. A man and a woman are truly in love, but something greater stands in their way, and they defer to it. 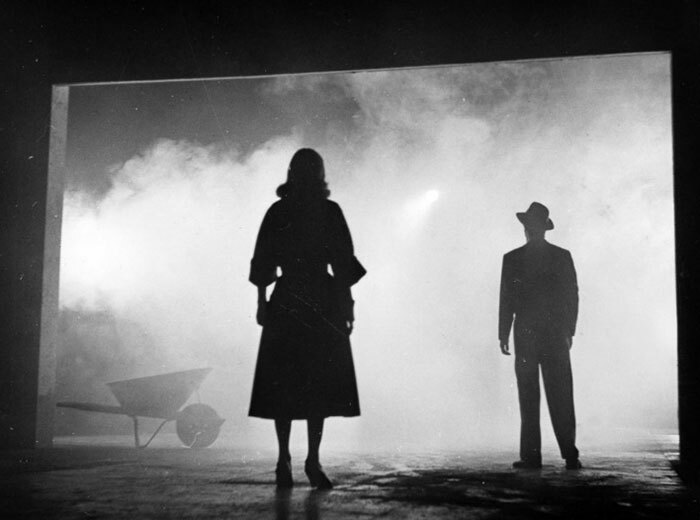 The Big Combo is a self-conscious film noir, with all the post-war cynicism that comes with that. The bad guy is caught, but the heroes are left with nothing but fog. Casablanca ends on a note of inspiration – Rick and Renault walk off in the fog cementing a friendship and with hope that they can help the war effort. The Big Combo ends with a note of desperation – Diamond and Susan wander into the fog, two lonely people likely to remain so; the villain has been captured, but these two still have nothing to look forward to. It is rather interesting that even though Viktor Laszlo is valorized as an underground leader and the film clearly says that Rick does the noble and righteous thing by pushing Ilsa to support his efforts, Laszlo is basically the most boring guy in the whole movie. There’s a fairly large school of thought on the film that Rick is wrong about Laszlo needing Ilsa – he only needs his cause and will leave her behind the next time her presence threatens his work. On the flip side, Mr. Brown is easily the most magnetic person in The Big Combo, and while he’s an utter misogynist douchebag and you don’t in any way want him to escape, he’s a much more interesting and watchable character than any of the good guys. I don’t know whether The Big Combo director Joseph H. Lewis and writer Philip Yordan intentionally played off of Casablanca, but the ending subverts it in almost every way. Instead of being a boring but zealous war hero, our potential escapee is a charismatic misogynist criminal. Instead of a true love triangle with love and respect in all directions, we have a twisted triangle filled with hate and indifference. Instead of a bittersweet but hopeful ending, we have a superficially successful but somewhat empty ending. And stylistically, instead of romantic cinema’s soft focus and faintly noirish foggy lighting, we have self-conscious high contrast lighting and enough fog to choke a horse. Both films are pretty great at the very different things they do; it’s fascinating that they end in such superficially similar ways, yet each ending clearly shows the different mood and worldview of its film.